I’d like to think that Christian vegetables–like VeggieTales’ Larry the Cucumber–will never be passé. There is, however, a new kid on the block in evangelical children’s entertainment: Max Lucado’s “Hermie, a Common Caterpillar” series. 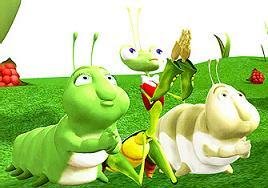 The series’ latest DVD is “Milo, the Mantis Who Wouldn’t Pray.” Starring a bug proprietor who loses his snack shack, the show focuses on Milo’s inability to talk to God about his problem. He sings about prayer, he dances, he wonders if he should use fancier words like “Thou,” he asks why heavenly help doesn’t arrive. But for upwards of 20 minutes, Milo the mantis doesn’t say a certain word we’re waiting for.